There are more than a few iPhone/iPod battery packs floating around these days, but Kensington's gone and thrown one in with its new $70 charging dock. 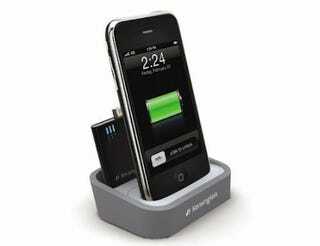 The err, adventurously named 'Kensington Charging Dock with Mini Battery Pack' comes with its own mini battery that charges next to your dock-compatible iPhone/iPod. Kensington claims it'll provide an extra 30 hours of music or 6 hours of video on an 3rd generation iPod Nano, and an extra 3 hours of talk time on an iPhone. Kinda cool, but enough to make you excited for yet another iPod dock?